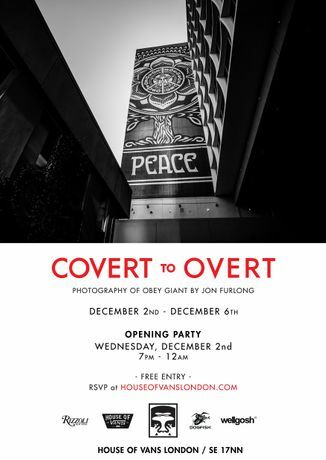 House of Vans London is proud to present Covert To Overt, an exhibition documenting the artwork, travels, installations and operations of prolific street artist and Obey founder Shepard Fairey and his team, through the lens of photographer Jon Furlong. For the first time ever in Europe, a selection of over 50 never seen before photos, spanning the artist’s last 5 years of activity will be on view at House of Vans Londons' iconic gallery space, providing an intimate window into the world of Obey Giant. The exhibition will be on display for an exclusive 5-day run, with the launch event complemented by a loop of exclusive documentary footage on show in the Cinema room, a screen printing workshop, DJs and an Obey merch stall.